The South African Reserve Bank will ensure that inflation in the African country does not hit the upper end of its target band, Deputy Governor Daniel Mminele said. “Depending on unfolding events in the global and domestic environment, the bank stands ready, as always, to act in whichever manner is prudent, in line with its mandate, to ensure that inflation does not breach the upper end of the inflation band on a sustained basis and results in a deterioration of inflation expectations,” said Mminele in a statement published on the central bank’s website. The Reserve Bank expects inflation to average 5.9 per cent this year. Mminele said that the impact of “global risk aversion has been somewhat more severe on South Africa” than most other emerging economies. The US Federal Reserve’s possible reduction of stimulus packages would adversely affect South Africa, warned the deputy governor. “A withdrawal of global liquidity would equate to a withdrawal in capital inflows to emerging markets, which would remove a source of financing for emerging markets and potentially lead to a sharp rise in term premiums,” he said. The rand has lost 14 per cent against the dollar this year, faring worse than the Indian rupee which has lost 12 per cent. 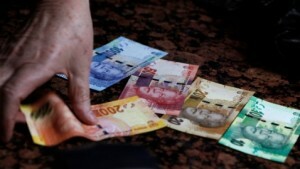 The South African Reserve bank has trimmed the country’s GDP forecast from 2.4 per cent to two per cent for 2013. Among the challenges faced by the economy is the “possible disruptions from strike action as part of the current wage negotiations in various sectors” warned Mminele. South African mining companies have been hit by wildcat strikes and a bitter turf war between the National Union of Mineworkers and rival union AMCU over representation of miners.